A look at the dark side of life, Victorian-style, when nothing was quite as it seemed and a public execution could be an entertaining family day out. Murderers, poachers, thieves, pickpockets and vagabonds all went about their business with impunity. Crime took place on the streets, on public transport, in homes, pubs, prisons, asylums, workhouses and brothels - it was all part of everyday life in Brighton and Hove in the late 1800s. Read about the notorious railway murderer, Percy Lefroy, who appeared at his trial in full evening dress and went to the gallows in an old brown suit. Gasp at the audacity of a temptress who fell in love with a doctor and tried to poison his wife, with strychnine laced chocolate. Then there's little Emily, a girl who received imprisonment with hard labour for stealing a few tempting pieces of gingerbread while a gaggle of disruptive young women loved causing a riot, flirting with men and smashing windows. 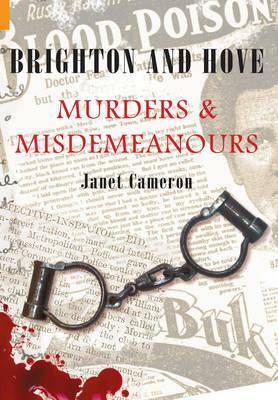 It was madness and mayhem in those weird and wonderful times - and it's brought vividly to life by Janet Cameron in Brighton and Hove - Murder and Misdemeanours.